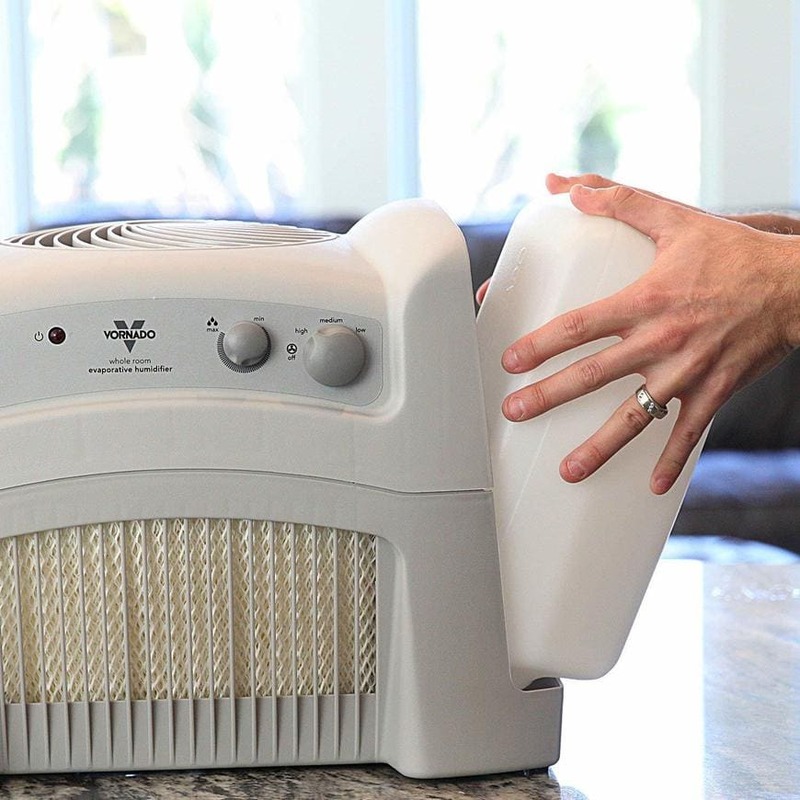 Humidifiers have long been a solution to dry air that leads to dry, cracked skin in the winter. In fact, for many, a humidifier may come in handy several times a year, when the air grows drier, leading to discomfort and even difficulty breathing. Moist air is much easier for the lungs to process and can help keep skin smooth and even hair healthier. Of course, you want to balance the amount of moisture in the air as well, since you don’t want your home to feel sticky or humid. But not all humidifiers are the same. In fact, there are two distinct categories – cool and warm mist – of humidifier, and choosing the right one for your needs, especially with so many models available and advice coming from a million directions, can get confusing. What are the benefits of a cool mist humidifier versus a warm mist humidifier? And, more specifically, what is a cool mist humidifier and what does a cool mist humidifier do? To figure out its purpose, first consider the way each type of humidifier functions. Why Use a Humidifier at All? Why Choose a Cool Mist Humidifier? The original technology for humidifiers required a warming source. These warm mist humidifiers use heat to boil water, creating vapor that disperses into the room, simply released and allowed to rise into the air based on the ‘heat rises’ law of physics. Boiling is accomplished with an internal heating element that also kills any bacteria that might be in the water. Essentially, the air is moistened with steam in these applications, which can work well for some but may be an issue in certain circumstances. It’s great for those with allergies, coughs, or infants who can’t yet use cold medication. By contrast, cool mist humidifiers don’t require heat to create mist. Instead, you have two distinct types of technology that create cool mist. The first, evaporative wick, pulls water into a wick that is then blown by a fan, causing the water in it to evaporate. The evaporated water enters the air to moisten it, improving your environment. The second, ultrasonic technology, sends ultrasonic vibrations through the water, causing it to break into incredibly small particles that are then dispersed into the air with a fan of some sort. Both technologies have their appeal and choosing which you prefer again should be an informed decision. Evaporative cool mist humidifiers have an internal wick that absorbs water inside or as part of a filtration device. A fan then blows air through the filter, which causes the water contained in the wick to evaporate into tiny particles. The same air flow sends those particles out into the space in a steady, light stream of ultra-fine, invisible mist that is typically produced at room temperature or slightly below. In an ultrasonic cool mist humidifier, there is no fan and no wick. Instead, the device uses sound waves – ultrasound – to break the water into minuscule particles, essentially creating a mist. The mist then disperses into the air in your home, allowing for moist air to carry and thoroughly humidify a large space in an extremely efficient and quiet way. Prolonged exposure to low humidity can really cause your health to suffer, and it’s important to assure you are protected against health risks, making a cool mist humidifier an even more important addition to your environment in winter, when you need it most. 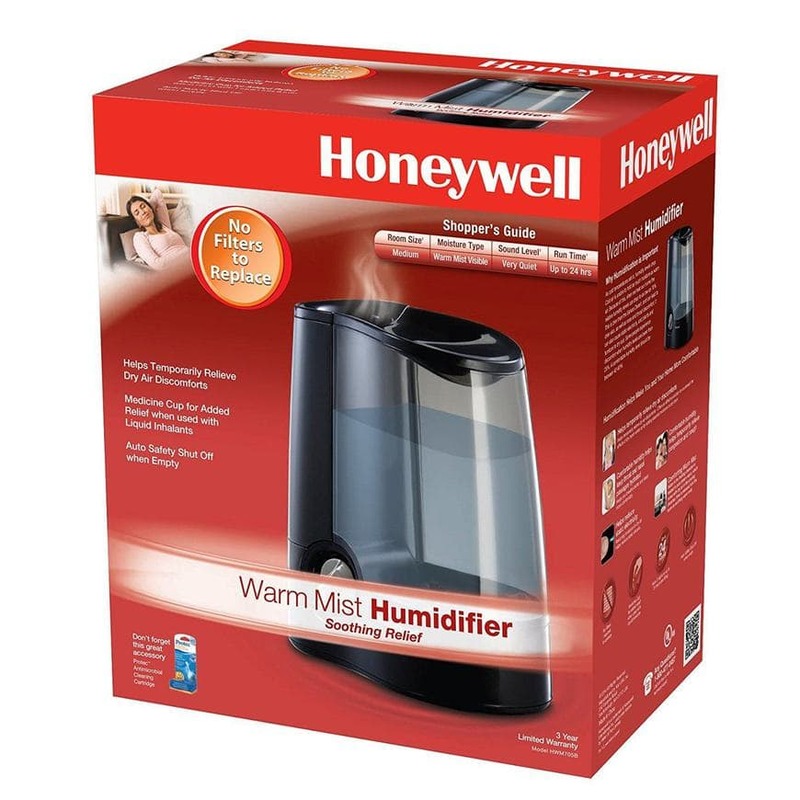 You have a choice of humidifiers when it’s time to help moisten the air in your home or office. Warm air humidifiers have long been available and helped maintain health through the winter, while newer advances in technology have made cool mist humidifiers more popular. Essentially, both a warm mist and a cool mist humidifier accomplish the same goal. However, there are several reasons you may want to opt for a cool mist humidifier in your space. Safety. Warm mist humidifiers can be a safety hazard, especially if you have children or pets. A child too close to the steam risks a burn, and children and animals both could bump into the unit and splash boiling water on their skin, leading to an even worse burn. With a cool mist humidifier, there is no heating involved, so you never have to worry about your child or animal getting hurt. Size and Space. Warm mist humidifiers don’t have a great reach due to the use of steam. As steam cools, it turns back into liquid, and the water droplets fall to the surface beneath – in most cases, the floor. That means that you can only moisturize a certain amount of space with these units. However, with a cool mist humidifier, you aren’t counting on a high temperature keeping the water in the air. Instead, the room temperature molecules are projected with a fan outward, so they travel further, allowing cool mist humidifiers to work for much larger spaces. Cost. Because there is no heating element, a cool mist humidifier requires far less electricity than most warm mist humidifiers, making them far more cost effective to run than their older counterpart. Noise Level Warm mist models typically aren’t very quiet. They make noise through the heating element as well as with boiling water. Cool mist humidifiers tend to be far quieter. The fan on evaporation models is virtually noiseless, with just a slight background hum that can actually be a soothing white noise rather than a disruption of sleep. The ultrasound models make almost no sound, since they don’t require a fan or other propelling force to move the air throughout the space based on the technology. 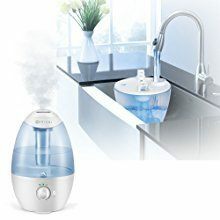 When you decide to buy a cool mist humidifier, you should consider several details that can affect your decision in purchasing a particular unit. First, think about the space you want to cover and humidify. There are different sizes that produce more or less moisture to help soothe the dryness that irritates your skin and lungs. The biggest difference you’ll find is in terms of price, with larger, more powerful misters costing more. Another important factor is which type of cool mist humidifier to purchase. With two kinds of technology to choose from, you’ll want to decide how important quiet is to you. While the evaporation models aren’t loud, they do make some noise due to the use of a fan. It’s a quietly run ‘white noise’, but if you prefer absolute silence, you may not be happy with this option. The other type, an ultrasonic humidifier, has a slight vibration to it from the ultrasound. However, it is virtually silent in its operation. By contrast, if you prefer background noise, the ultrasonic models may not be your best bet. An additional concern is the cleanliness of the air. Warm mist humidifiers automatically sterilize the water put into the atmosphere through the boiling process. While cool mist humidifiers don’t do that, many of them do have a filtration system that cleanses the water through a carbon or similar filter. This assures that you don’t breathe in any harmful spores and helps to keep any bacteria to a minimum. This also means that you want your humidifier to be easy to clean so you can do your part to keep it in good, clean working condition. Finally, the size of the tank and adjustability of the stream of vapor is important. You may need more or less moisture added to your home, depending on how dry the air is, and if you can’t adjust the flow of the unit, you could end up with your area being too damp. Also, you’ll want a tank large enough to at least last through the night, and if you want to run the humidifier at all times, you should opt for a tank that can run 24 hours without a refill. However, a tank that is too large for your application, especially if you’re only going to have the unit on during certain periods of time, can lead to becoming a breeding ground for mold and bacteria, with water sitting unused for large amounts of time. In order to keep your humidifier working well, you’ll need to care for it properly. This involves cleaning it on occasion to avoid the build up of mold and mildew. If you leave water sitting in the humidifier for long periods of time without use, you run the risk of harmful bacteria settling into the water, which is toxic to the environment, whether left sitting in the tank or turned on and sprayed into the air. You should empty your cool mist humidifier regularly and add fresh water for use, especially if you haven’t used it in several days or weeks. In addition, you should clean the tank and any filter being used regularly. When the filter has been used for the designated period of time, you should consider replacement immediately. Not all filters require replacement; in fact, many can be cleaned now without worry of damage. However, be sure you’re aware of the needs of your particular humidifier model, and don’t continue using a filter beyond a safe age or number of uses. 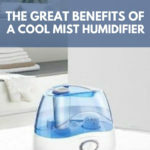 Making the purchase requires research of several different brands and models of cool mist humidifiers, but having a list with the most important details of some of the most popular and best rated models can help. Here are some options to consider. Using the ultrasonic technology to create mist keeps this particular unit quiet in its operation so you barely even notice it’s on. There are two speeds so you can adjust the output of humidity in your space, and you can change the direction of the flow of mist. The tank holds 1.5 liters, which makes it perfect for a large open space, including larger bedrooms, offices, and living spaces. Best of all, when the water level gets low or the tank is removed, it has an automatic shutoff feature that keeps it from burning out due to working while dry. Other features include a night light that can help you see moving around at night – and avoid bumping into the unit, a 2 year warranty that is one of the best in the industry, 7 day a week customer support, and a disk cleaning brush to help retain the cleanliness that is so important to the health of your home and family. One of the best features of this model is that it has a very long stream of mist, which helps disperse the moisture further into the room and avoids condensation on and around the unit. It also helps cover a larger room, keeping the air at a comfortable level of humidity. The 0.9 liter tank means that, depending on the settings you choose, a single tank will give you between 20 and 36 hours of operation. There is no filter in this unit to worry about, meaning you don’t have to clean or replace an additional part. There are also controls to adjust the humidity level, as well as the direction of the mist. The materials used in construction are antibacterial, and the base has a deep groove design to prevent any leakage or possible cracking. The large tank ((2.8 liters) on this cool mist humidifier assures you comfort through an entire night and then some, with no need to refill or worry about running dry. It’s also multipurpose, with the ability to work for aromatherapyas well as ionizer, air purifier, and nebulizer. The 7 color LED night light allows you to choose the most soothing color for your use. This particular humidifier also has a safety shut off feature that stops function when the tank is empty so there is no operational malfunction. In fact, unlike many humidifiers, this one has an ETL Safety Approval. Included in the package in addition to the unit itself are two e-books, an e-course, and 3 scented satchels for aromatic decadence. Made by a trusted name brand in home appliances, the Honeywell unit offers quiet operation with 3 speed settings that allow you to adjust not only the output of mist but also the amount of noise produced, so you can assure a good night’s sleep without interruption. The low setting allows the humidifier to operate for up to 24 hours without refilling, and the recessed handle makes it easy to carry. This is an evaporation model with a wicking filter, which removes impurities in the water and is protected with Protec antimicrobial so you don’t have to worry about mold growing in the filter. This filter is easy to replace and long lasting for great performance. This all also creates a 99.9% germ free environment so you breathe better with peace of mind. There is also a display that shows the relative temperature and humidity in the space for better control. Cleaning is easy with a break resistant design that is even dishwasher safe. One of the most useful features of this model is the dual 360 degree control with mist nozzle, allowing you to control direction and speed of the mist produced. In addition, the large 3 liter tank means you never have to worry about refilling the humidifier in the middle of the night. You’ll have hours of misting, even at the highest output, and it will cover a medium-large sized space, including bedrooms and large offices. The LED nightlight has 3 soothing colors that can help create a calming effect for a better night’s sleep, and the silent operation means that excess noise won’t keep you up at night or distract you while you work. The automatic shut off feature works when the tank is low on water or when the tank is removed, keeping the humidifier in top working condition at all times. You can even add aromatic oils for a great scent to help you sleep. Made specifically for smaller spaces by one of the top names in the industry, this smaller cool mist humidifier takes care of bedrooms and other smaller rooms, with extremely quiet operation to allow you to sleep in comfort and silence through the night. Even with a small 0.5 liter tank, the unit will operate up to 20 hours without refill, if at the lowest setting, meaning you can expect continuous performance with less interruption. The removable tank has a wide opening that makes it easy to fill and a handle that offers ease of carriage to and from the base. The mist settings have an adjustment control so you can slow the flow or increase it in extremely dry weather. There is no filter that needs to be cleaned or replaced, and the unit can utilize Vicks VapoPads that add menthol to the vapors produced. The unit comes with a sample for your enjoyment. This unit also shuts off automatically when it’s empty. And if you are concerned with design, you can choose from four different color options. Whether you opt for a cool mist humidifier or the heated unit that produces steam, you’ll find that you breathe easier through the winter. 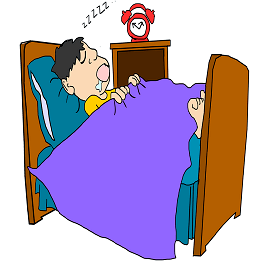 You’ll sleep better for sure, with less congestion and skin irritation from being dry, cracked and itchy. Humidity in the air can help relieve burning, bloodshot eyes, chapped lips, and raw sinuses that bleed and are more susceptible to infection. You may also find that many allergy symptoms are relieved, between promoting the healthy production of mucus to protect you from allergens and the cleansing provided by filters and other antimicrobial pieces included in many cool mist humidifiers. You’ll enjoy less static cling from your clothes and less static electricity shocking you, since these are byproducts of dry air. Even the wood in your home will stay in better shape, since dry air can cause wood to crack and disintegrate over time. 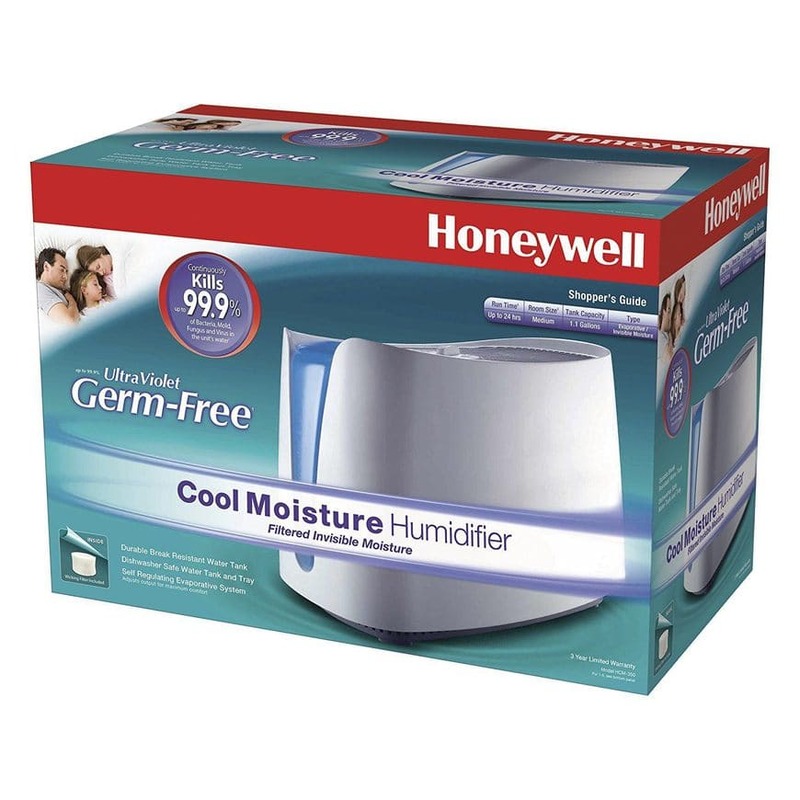 Because most humidifiers have controls for output, you don’t have to worry about too much moisture in your home feeling sticky or damaging items, either. In winter, humid air feels warmer, so you won’t feel the need to run the heat as much, saving you money and making the air less dry to start with. You’ll find that a great many health issues resolve themselves with the addition of a humidifier, and using the cool mist version will assist in keeping your family safe, with no chance of children or pets getting burned.